As a sales and marketing professional, Simon has had a rich and varied career. With over 15 years experiencing in the IT industry, as both client and supplier, he has a unique insight into the challenges and needs of the customer, and how technology can remove problems and facilitate growth. Simon is also a keen songwriter and aspiring children's author. Kashif is a Microsoft and Apple Certified engineer. Kash says, “I’ve been working in IT for over 10 years. Every day is different and a challenge, it never gets boring!” At the weekend Kash enjoys biking trips to the coast and that all important family time. Our MD, Mark is a chartered IT professional, member of the British Computer Society and has a degree in IT Networks and Communications and has been working in the industry since 1995. Mark started his IT career working for Sheffield Hallamshire Hospital, before moving into senior roles in regional IT companies. Mark then decided he wanted to be his own boss and set up Netcom, building it into a forward thinking innovative IT support provider with a national reach. 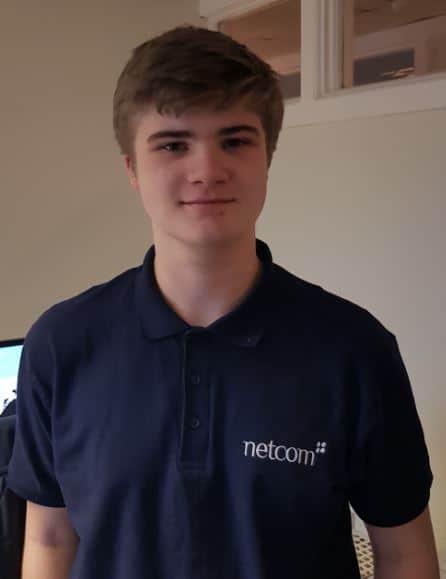 After spending a summer at Netcom on work experience Lewis was offered a full time apprenteship and is currently studying towards a Level 3 NVQ IT professional qualification. In his spare time Lewis enjoys gaming, building computers and mountain biking. Neil is a graduate from Sheffield Hallam University and has worked in the IT industry since 2001. Neil has delivered large scale global IT projects, working in both the private and public sector and finds transforming businesses very rewarding. Headhunted by BT, Neil eventually became BT's Director of Global Manufacturing and Distribution. Neil loves Sheffield so much he recently relocated back from Oxford! Gary has over eight years' experience working in ICT and is an experienced EPICOR and Enterprise Resource Planning (ERP) consultant. He specialises in using EPICOR software products to create and drive efficiencies within businesses. Duncan has a BSc (Hons), Physics from Imperial College and has worked in IT for 18 years. He started his career in large scale global secure networks including working for Lastminute.com and EasyEverything (Internet cafe arm of Easyjet). After years of jetting around the world he decided to settle back in Sheffield, his extensive IT knowledge has enabled him to build hundreds of secure business networks. Shane has a dual A+ Certification and is a Microsoft Certified Professional with over seven years experience in the IT industry. He has previously provided IT support to the retail, manufacturing and aerospace sectors. Chris manages our accounts and finance team and is one of the people you can talk to if you have invoicing, contract or payment queries. He's also the man who pays all of our wages so we're always really nice to him. Chris is MAAT qualified and is a Chartered Management Accountant. Chris likes nothing more than to get his head into a good set of management accounts, his favorite ice cream is vanilla. If you have accounts queries the Kathleen is one of the team who can help. Working towards her ACCA Kathleen is a true number cruncher and loves the way Netcom clients treat the Netcom team as an extension of their business. Kathleen's favourite colour is red.